This five-session workshop series is designed to deepen your understanding, boost your confidence, and answer questions that surfaced after you got out of the water. 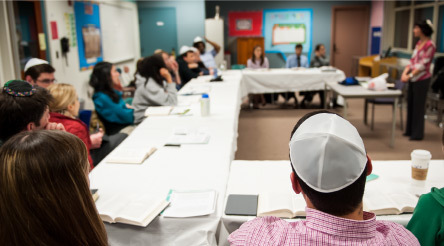 Interactive and experiential learning for people who chose Judaism — no matter how long ago that was. Partners are encouraged to attend. Taught by Rabbi Leslie Gordon, it will include ritual topics such as: Shabbat, keeping kosher, prayer choreography and ethical concerns such as giving tzedakah and honoring our parents. Have you ever wanted to know more about Judaism but were afraid to ask? The Jewish Discovery Institute is offering a free course to help you learn some of the basic tenets of Judaism. Topics could include God, Torah, Israel, Jewish Thought, Jewish History, and the Jewish calendar. Bring your questions, concerns and curiosity. This is an ideal course for interfaith couples and individuals who want to learn more about Judaism. Have you felt awkward, frustrated or overwhelmed in a synagogue service? Now is your chance to make yourself at home with the beautiful and inspiring liturgy of the Jewish tradition. Join us to unravel the structure, choreography, and meaning of the traditional Jewish prayer service. No previous background in Hebrew or Jewish education is necessary, just the desire to learn. For information, please call 617-219-9775 or email info@jewishdiscoveryinstitute.org.